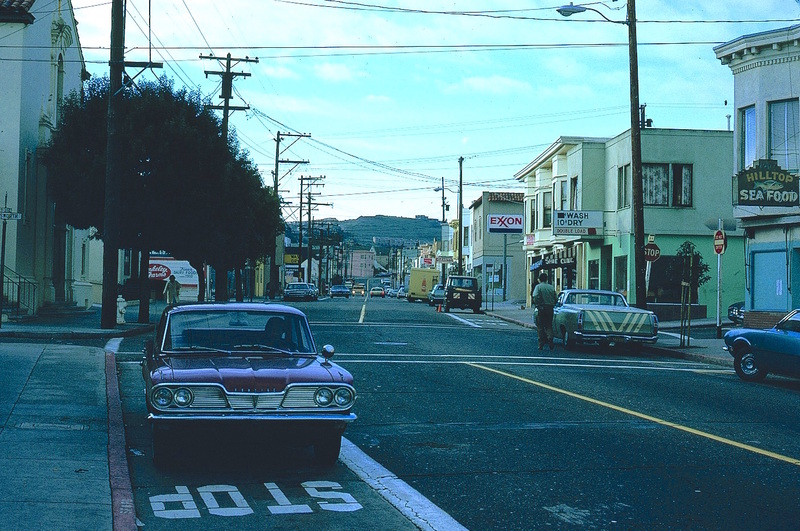 A few weeks ago, Neighbor Vicky Walker from the Bernal Heights History Project shared a URL with your Bernalwood editor, pointing me toward a wonderful collection of historical photos of Bernal Heights, mostly from the 1970s to the 1990s. 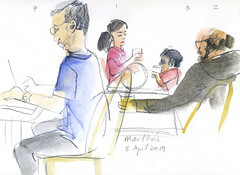 Geography Professor Emeritus Max Kirkeberg of SFSU should also be known as Neighbor Professor Max, because he has lived on Peralta for decades. 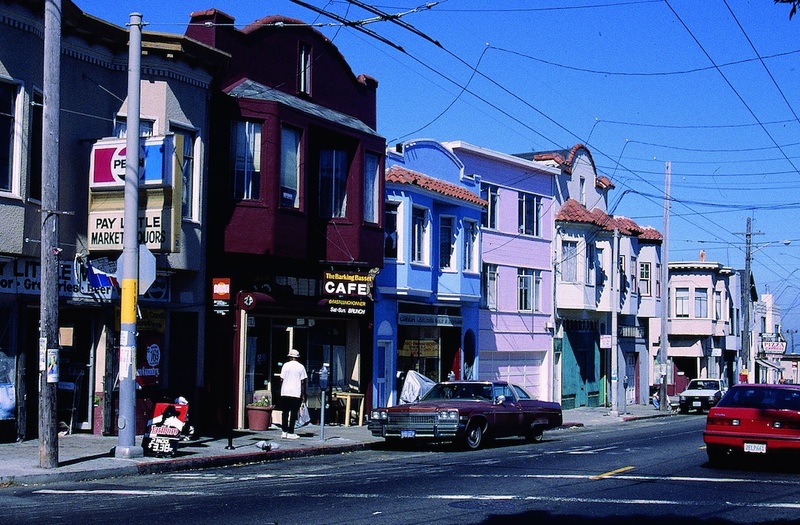 He’s now officially retired, but he taught urban geography and led countless field trips and walking tours around San Francisco for SFSU and the Osher Lifelong Learning Institute, taking what he estimates as 60,000 photographs of various city neighborhoods since the early 1970s. The Bernal History Project knew about Max because he shared many of his photographs with us over the years. But our more recent discovery that thousands of his pictures are available online for free was magical. So far, 2,770 of Max’s photos are available in the Max Kirkeberg collections as part of the DIVA archives at SFSU. 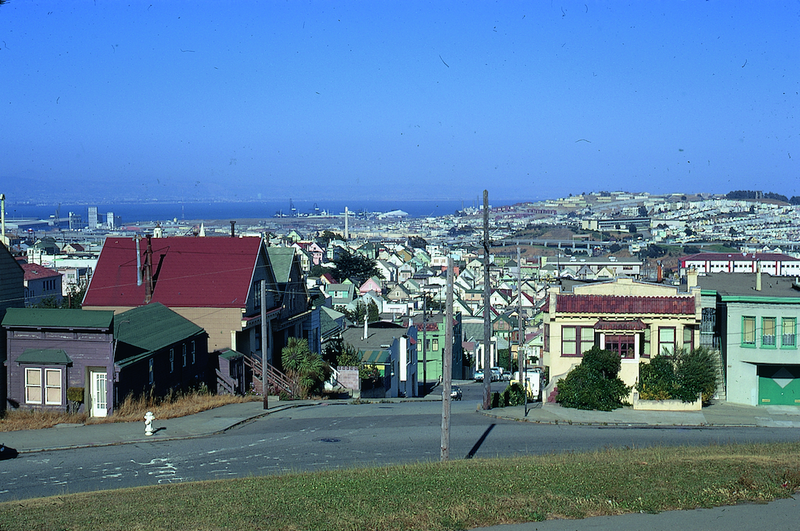 There’s a whole section devoted to Bernal Heights South — and lots of the photos are in color, including a batch of earthquake cottages. I called up Max to find out what other treasures he has. He says the online project began 9 years ago. He has 75 boxes of slides — around 60,000 photographs, he estimates — and SFSU wanted to use his pictures for DIVA, a pilot online archive project for other professors who might want to digitize their research collections. Erin Olson of the DIVA digitization team says the project’s goal is to digitize analog collections like Max’s slides and, if necessary, help organize and catalog them, and make them available for the public to see. 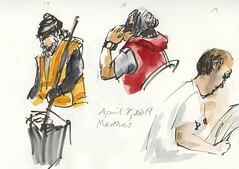 “Ultimately, with Max’s information, we hope that a full digitization of his collection will serve as a unique and important documentation of San Francisco’s vast geographical, architectural, and cultural history, as well as its development and progress,” she says. Max has gone through 9 or 10 boxes so far and says he is finding photos he hasn’t seen in 20 years. 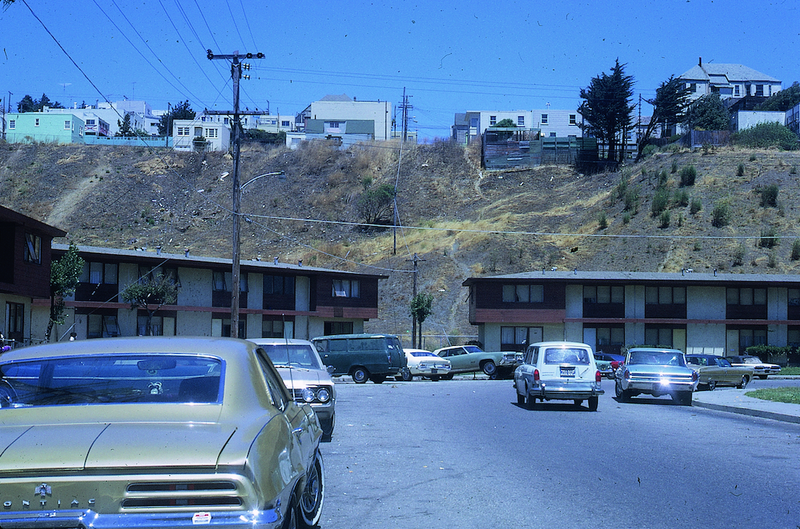 He estimates that the 503 photos that are logged under South Bernal are maybe a quarter or a third of the Bernal Heights slides, which is one of his largest collections. 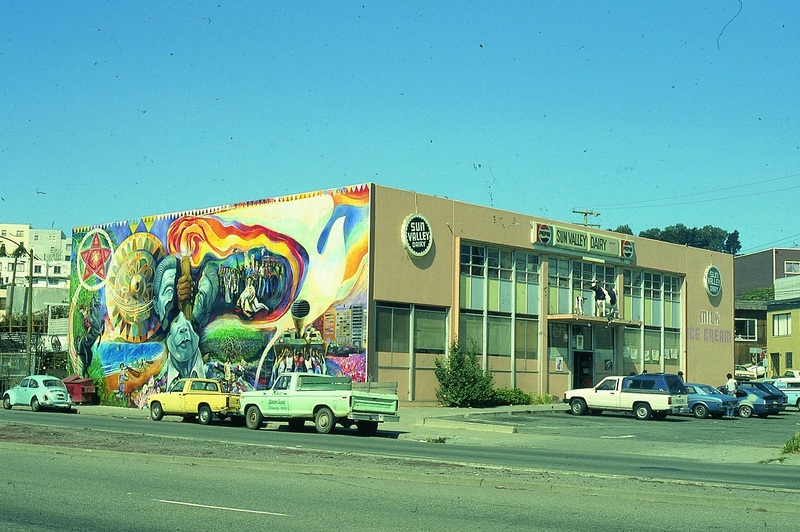 This was an anti-Ferdinand Marcos mural on the former Sun Valley Dairy building at 300 Alemany (at Crescent). Painted by Johanna Poethig (who recently did the “Story Cloud” mural on the back of the Bernal library), Vic Clemente, and Presco Tabios. 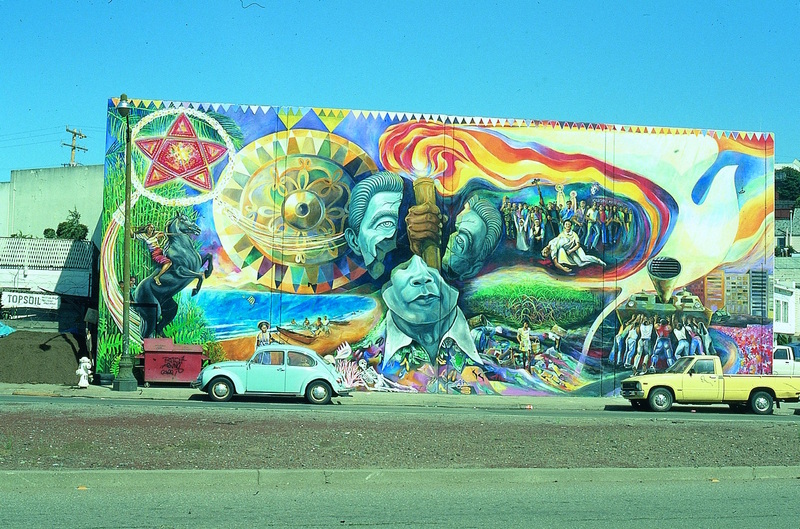 Commissioned by the San Francisco Mural Resource Center, it commemorates the 1986 revolution in the Philippines. Facing south, it was allowed to fade before being painted over in 2006. The church was sandwiched between Arrow Pharmacy and the Cherokee (today’s Lucky Horseshoe). Before the church moved in, the building’s history included a grocery store, a five-and-dime, and, briefly, artists from the National Center for Experiments in Television. Bald Eagle Sporting Goods replaced the church in 1977. This building was a hardware store for years, run by the McCoys and then the Thorsens. After the printers closed, it was a clay art workshop. Progressive Grounds has been here since 1996. Before the Wild Side West moved here from its Broadway location in 1976, the building was used as an office by architect Stephen Roake. The building was constructed around 1900, and housed a bakery run by the Gennheimers, the Hagemanns, and then the Perottos for its first thirty years. Northwest corner of Cortland Avenue and Wool Street. 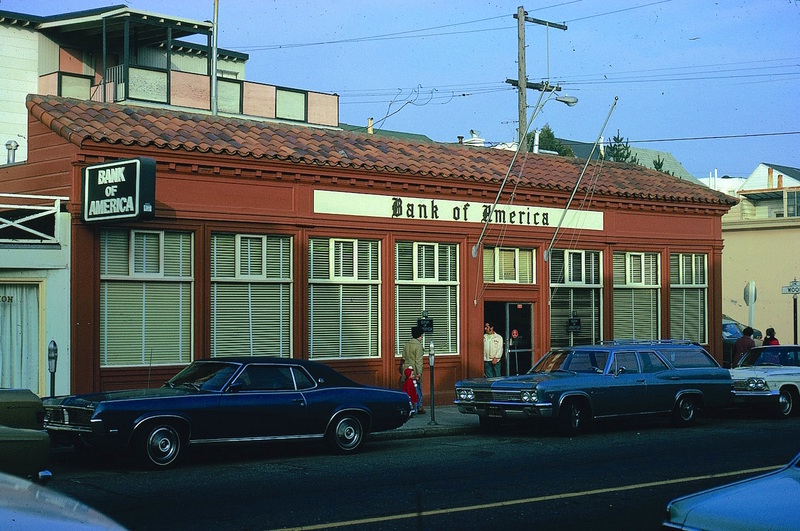 The Bank of America branch opened here in 1927 as the Bank of Italy; it has historically been the only bank on the street. 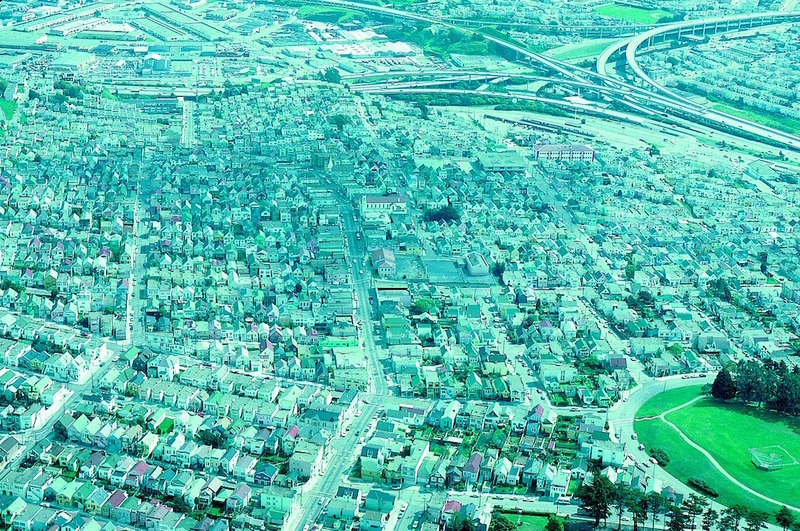 You get a good idea of the topography of Bernal in this one, as well as the development on the south side. Cortland Avenue runs down the middle of the photograph; the large buildings visible are Paul Revere School, the Bernal Library, and St. Kevin’s Church. Holly Park is in the lower right corner. Just visible beyond St. Kevin’s is the Emmanuel Lutheran Swedish Church building at Cortland and Folsom, which was then the Community Church Assembly of God. There’s been a lot of change on this stretch of Cortland. 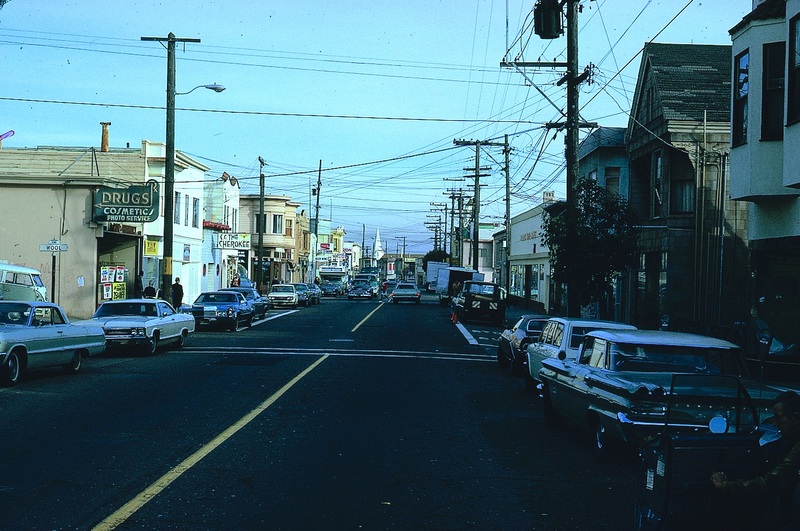 Frank Favaloro ran a fish market and bait shop at 801 Cortland from the mid-1950s until his death in 1961, after which Woodrow and Winifred Gaumond ran the store as Hilltop Fish Market. 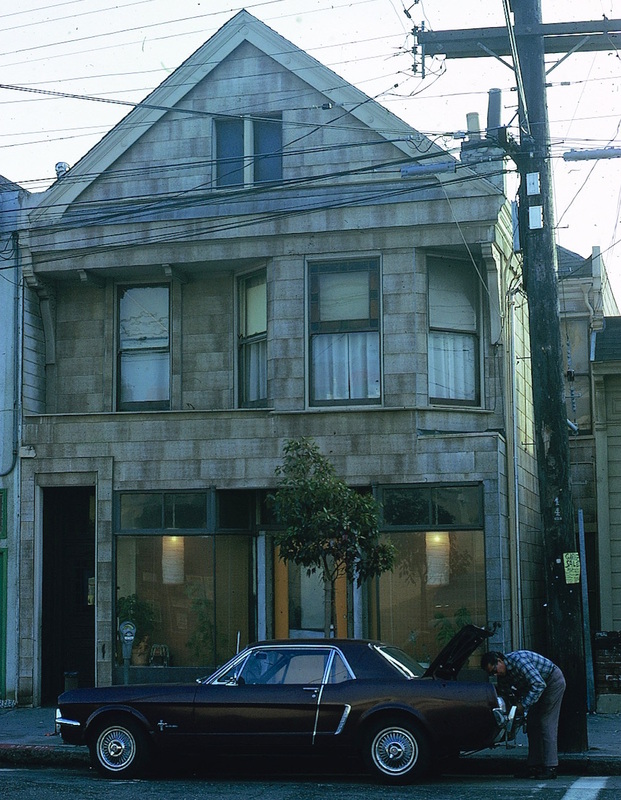 City records say 801 Cortland was vacant from 1967 to 1977 (but we would love to hear otherwise). Deese’s Records at 803 Cortland, run by Maude Deese, was only open for about a year. 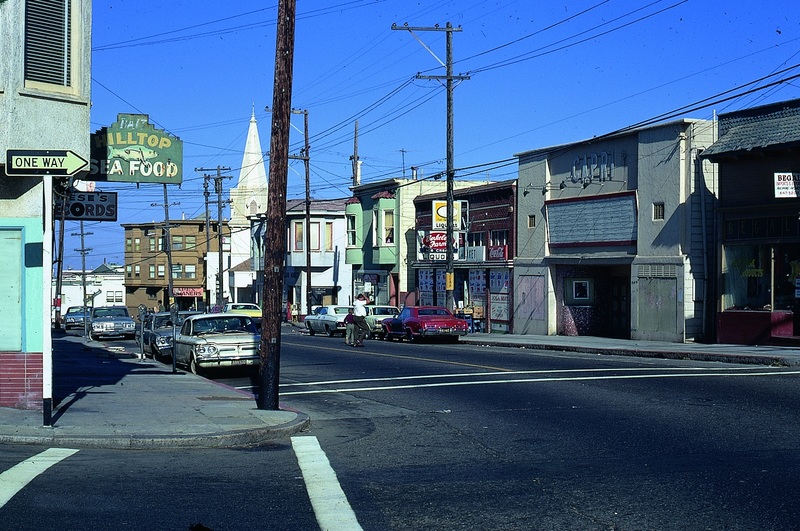 You can see the white steeple of the Assembly of God church at Folsom and Cortland, while the second building on the right is the former Capri Theatre, which closed in 1969. 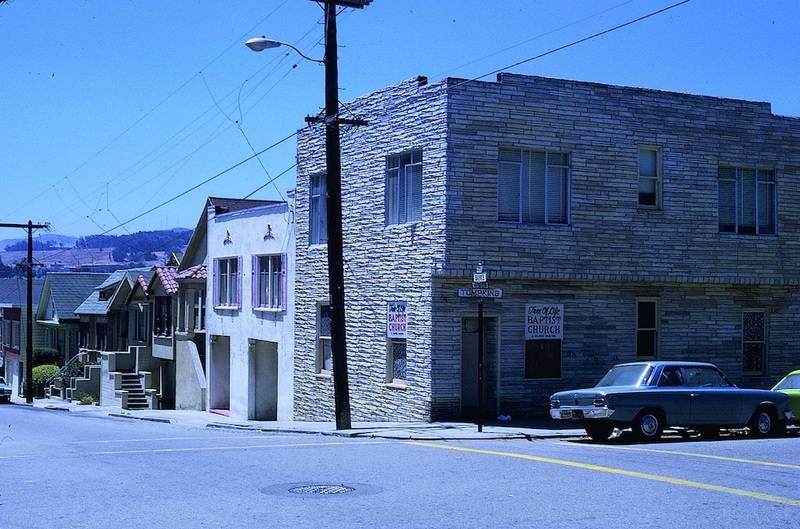 Behind the church in the brown building is Apex Cleaners and Dyers at 1000 Cortland, which opened in the early 1950s. Cutting Edge Salon has been in this spot since 1999. 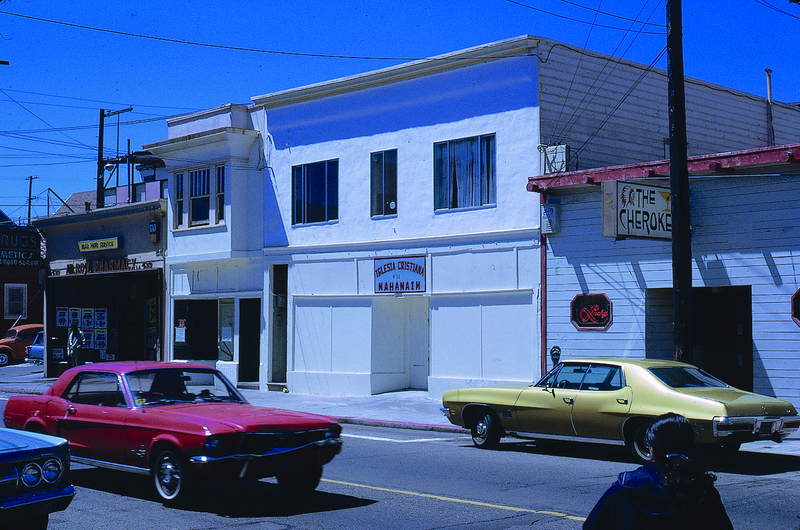 Sometime in the 1970s, the Capri Theatre building became the Victory Fellowship Bilingual Foursquare Church. The Assembly Church of God at Folsom and Cortland had a major fire in 1979 and is now gone. On the left side, Hilltop Sea Food has been replaced by Pay Little Market, which is still there today. 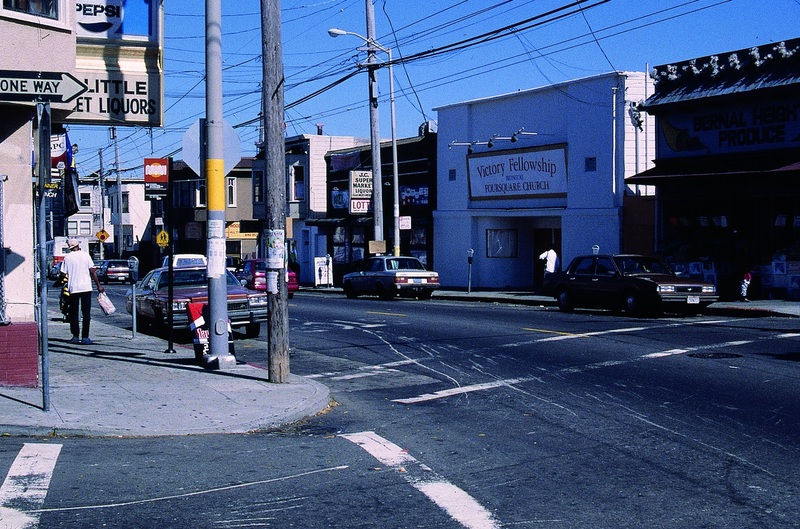 On the left, Arrow Pharmacy and the Cherokee (now Discount Club Liquors and the Lucky Horseshoe, respectively). Notable for being one of the few photos of Cortland Avenue’s gas station, which was replaced with lawyers’ offices in the early 1980s. On the corner of Ellsworth and Cortland is a self-service laundromat that will be replaced by Martha and Brothers in 1999. The Shoe Clinic next door is now part of Tacos Los Altos. After Deese’s Records closed in 1973, 803 Cortland saw a lot of activity, including a thrift store run by Larry Banks; Apex Realty; and the King Tut restaurant and deli. The Barking Basset restaurant lasted from 1993 to 2000. Today it is Red Hill Station. Whew. Amazing. Thank you Neighbor Vicky, and super-thank you Neighbor Max! And for the rest of us… good luck getting any work done for the rest of the day. Wonderful photos history of Bernal Heights & Cortland Ave; definitely a great variety of businesses back in the day; the theatre was a plus; years ago I had taken some shoes & handbag to be repaired at The Shoe Clinic, recommended by Mike’s/Noe Valley; unfortunately, when I moved to BH in 2000 & wondered on Cortland Ave, the place was gone; still surprises me that the taco place is still open; there are so many code violations; it amazes me that Alemany projects were ever allowed to be built on such prime real estate; they definitely need to be razed, such a blight to the area, still bleak; very glad that at least Cortland Ave has one bank; the strip definitely needs more. Wow Pamela where are you from? Read up on S.F. history specifically the history of the south eastern section of S.F. and perhaps you won’t be so amazed as to why the Alemany and other public housing projects were built on such ‘prime real estate’, btw it wasn’t always so prime. Your comments and opinions illustrate whats changing in S.F. and not for the better. Take it from some one who was born,raised and lived in Bernal Heights for 56 yrs. Bernal Heights is not just a place it was a ‘frame of mind’, I hope you get it. Well, in fairness (and somewhat more empathetically), it’s actually pretty hard to find anything to read about this… and I say that because I’ve tried. Not a whole lot has been written. Here’s what I know, and Gus, please chime in if I’ve missed any key points. Basically, until WWII, the area that is now I-280, between Bernal and Portola, was just a marshy area, home to a creek that fed into Islais Creek. During WWII, when the City experienced a massive population boom because of all the shipyard work at Hunter’s Point and Pier 70, housing was in very short supply. 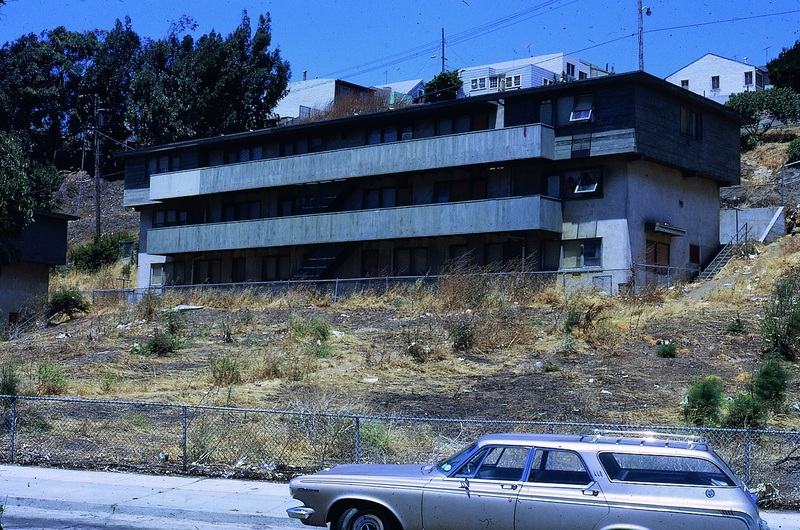 That’s when a lot of public housing was created — to house those blue collar workers. The area that is now I-280 became home to many rows of standardized public housing (which is obviously gone now, because I-280 is there instead). The question I’m not clear about is: Was the Alemany housing built at the same time as the rest of the housing in that valley? Or was it built separately and later? Oh, and Gus… I still think Bernal is a frame of mind. 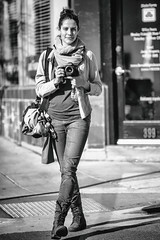 I had the pleasure of taking Max’s San Francisco on Foot class my first semester at SFSU. It remains the best course i’ve ever experienced. Kudos to Max, I hope he’s enjoying his retirement. Looks like there was an enlarged, glammed-up, purple earthquake shack on the North Newman/Holly corner. Replaced by a modern, and bigger, simple box today. It’s always great to see my neighborhood! These photos make me wish I was back home. My father the wonderful Elijah Taylor was featured in photos 8 an 11. Simply Beautiful! Thank you for sharing. love this so much! sf .. so packed with history. My parents House is in this collection. So great to see it before we moved into it in 84! these are wonderful, Vicky! As I’m sure you know, the wonderful folks at the Western Neighborhood Project are also in the process of organizing and digitizing a collection of photos they received from a generous donor that depict the entire city from very early in the 20th century. It’s such a gift!!! We’d love to hear about your father, rktaylor66 — and Brian, tell us more about your house! 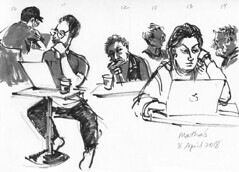 Drop me a line at info@bernalhistoryproject.org. 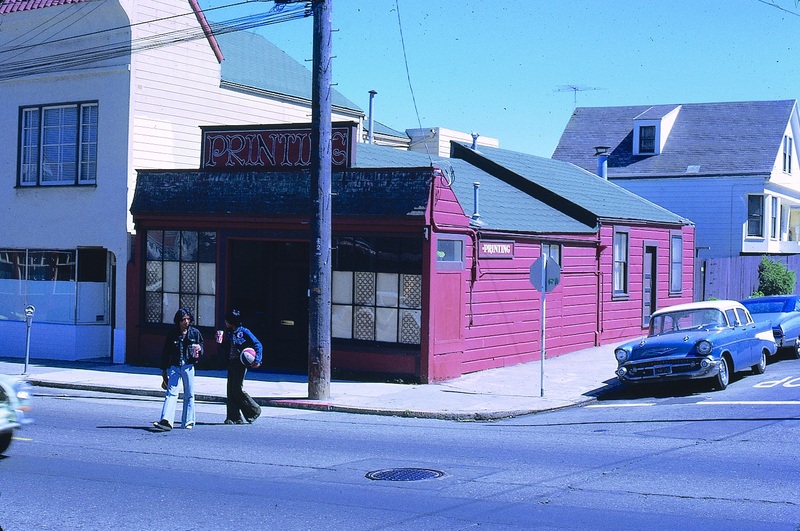 shrinkrap305, there are Bernal photos in the Private Collector series the WNP is digitizing. I’ll ask nicely and see whether we can get those together for a Bernal photo post. David, Nicole, Woody, and co are doing great work in the local history sphere.